This year as an Easter giving project, we are challenging you to fill buckets full of supplies that the teams use while serving in Haiti! This is a perfect project for churches, classes, Lifegroups, families, etc. Whether you fill one bucket or multiple, every supply is needed and appreciated! Some of the items listed below can also be found on the Mission Possible Medical Wishlist on Amazon. Money for surgeries, medication and vitamins are always appreciated, as well. 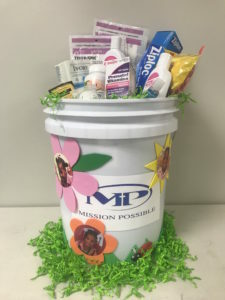 Buckets can be picked up at our Findlay office, or any five-gallon bucket or box will work!